Rate: $0.50 an hour, first hour free. Special Event Parking rates will apply during all special events. The parking fee during special events is $3.00 or $5.00. 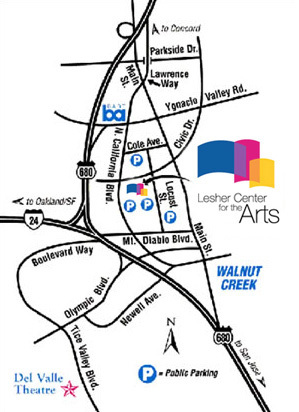 The Lesher Center for the Arts (1601 Civic Drive) is an easy 2 block walk from the Walnut Creek BART Station (200 Ygnacio Valley Road). (For a complete schedule of BART times and fares, you may wish to consult the BART website or to travel by bus, please visit the Central Contra Costa Transit Authority website. From the Richmond/Berkeley area, take a Fremont train to MacArthur Station and then transfer to a Pittsburg/Bay Point train to the Walnut Creek Station. From the Fremont/San Leandro area, take a Richmond train to 12th Street/Oakland City Center Station and then transfer to a Pittsburg/Bay Point train to the Walnut Creek Station. From the Dublin/Pleasanton area, take a Daly City/Colma train to Bay Fair Station, then transfer to a Richmond train to 12th Street/Oakland City Center Station and then transfer to a Pittsburg/Bay Point train to the Walnut Creek Station. From the Antioch/Pittsburg area, take a Daly City/Colma train to the Walnut Creek Station. From the Colma/Daly City/San Francisco/Oakland areas, take a Pittsburg/Bay Point train to the Walnut Creek Station. From the Walnut Creek BART Station, walk 2 blocks south on North California Blvd (behind the Target store) to Civic Drive. 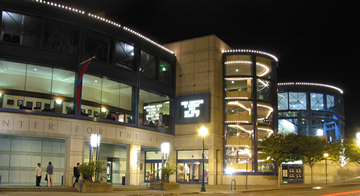 (As you walk along North California Blvd you will be able to see the Lesher Center for the Arts lighted marquee listing upcoming events at the Center.) Turn left onto Civic Drive where you’ll find the Ticket Office and the main entrance under the portico. Enjoy the show!